The following terms and their definitions are of great importance for the correct comprehension of the objectives, context and policies described herein. IP address allocation follows a hierarchical scheme. Responsibility for the administration of number resources is distributed globally in accordance with the hierarchical structure shown below. IANA is responsible for allocating part of the global IP address space and autonomous system numbers to Regional Registries according to established needs. An Internet Registry (IR) is an organization responsible for allocating IP address space to its members or customers and for registering those allocations. IRs are classified according to their main function and geographic area of coverage as indicated in the hierarchical structure defined in the figure above. 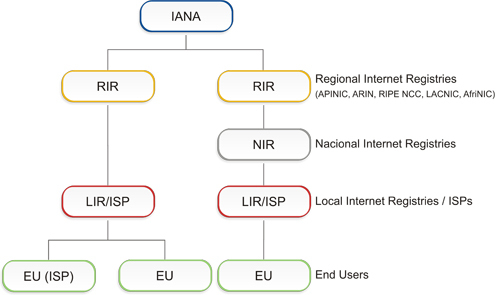 Regional Internet Registries (RIRs) are established and authorized by their respective regional communities, and recognized by the IANA to serve and represent large geographical regions. The primary role of RIRs is to manage and allocate Internet resources within their own respective regions. A National Internet Registry (NIR) primarily allocates Internet resources to its members or constituents, which are generally LIRs. A Local Internet Registry (LIR) is an IR that primarily assigns Internet resources to the users of the network services it provides. LIRs are generally ISPs, whose customers are primarily end users and possibly other ISPs. Internet Service Providers mainly assign IP address space to end users of the network services they provide. Their clients may be other ISPs. ISPs do not have geographical restrictions as do NIRs. To assign means to delegate address space to an end user, for specific use within the Internet infrastructure they operate. Assignments must only be made for specific purposes documented by specific organizations and are not to be sub-assigned to other parties. A site is considered to be multihomed if it receives full-time connectivity from more than one Internet service provider and has one or more routing prefixes announced by at least two of its upstream providers. Independent providers refers to the fact that one does not reach the Internet through the other. The fundamental principle is to distribute unique Internet numbering resources according to the technical and operational needs of the networks currently using, or that will use, these numbering resources, allowing the sustainable growth of the Internet. The numbering resources under the stewardship of LACNIC must be distributed among organizations legally constituted within its service region [COVERAGE] and mainly serving networks and services operating in this region. External clients connected directly to main infrastructure located in the region are allowed. "Anycast" services that use numbering resources outside said region are acceptable as long as they are provided by an organization legally constituted within the service region [COVERAGE] and at least one copy of the service is hosted on local infrastructure. Internet numbering resources must be distributed ensuring their uniqueness and considering the technical and operational needs of the networks and infrastructure that use them. Considerations must be made to take into account potential limitations on the availability of each numbering resource at the time of their distribution. Providing a public registry of information relating to the numbering resources that have been distributed is a fundamental requirement for the Internet numbering resources distribution system. Aimed mainly at ensuring the resources' uniqueness while providing usage and contact information in case operational or security problems arise. Also, to allow analyzing the use of these resources. The hierarchical distribution of Internet numbering resources seeks to contribute to the Internet routing system's scalability, allowing resources to be grouped and announced as concisely as possible. In some cases, the goals mentioned above may be in conflict with each other or with the particular interests of the requesting organizations. In these cases, a careful analysis of each particular situation is required so that an appropriate compromise can be reached among the conflicting parties.